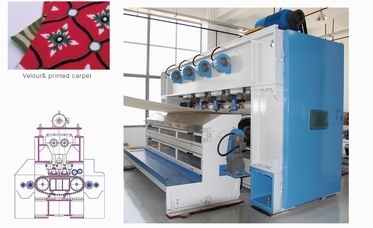 The purpose of random velour machine is to make a pile effect on the surface of a nonwoven substrate for end uses such as automotive, floor covering, wall covering and felt for toy etc. Main specifications Raw material Synthetic fiber such as Polyester, Polypropylene, etc Product weight (350-800) gram/ m2 Working width (2500- 4500) mm Needle density 5000n/m* 2 needling area Needle stroke 30mm Needle frequency 1400s/min Structure. High precision double crank shaft system drives high strength needle punching system made of aluminum alloy. 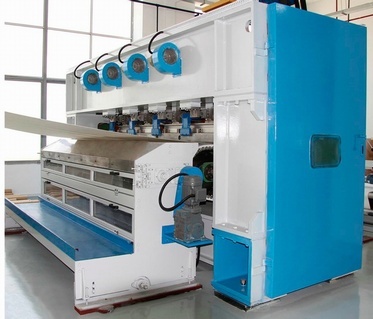 Main bearing equipped with automatic oiling system and forced-air cooling system for stable running. Automatic oiling lubrication with special material for guiding system, no oil leakage. High quality long service life brushes are fitted into a unique brush conveyor system which offers a perfect penetration base for a clean smooth material surface during running. Right brush stripping point with mark free. Equipped with special cleaning system. The whole machine utilizes PLC interface by touch screen and PLC programmable controller to make operating parameters and conditions easy to change, repeat or maintain.